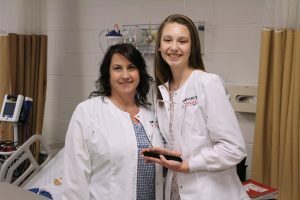 Beth Allen and Morgan Thompson have been selected as Career & Technical Education Students of the Month at John Marshall High School for April. 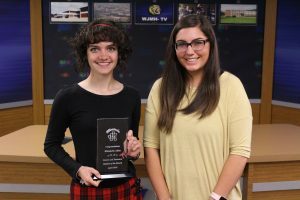 From left: Beth Allen and Broadcasting Technology teacher Carly McElhaney. Beth is a senior in the Broadcasting Technology program and is the daughter of Bob and Courtney Allen. Beth will attend West Liberty University to major in Broadcasting. Therapeutic Services teacher Lora Kull and Morgan Thompson. Morgan is a senior in the Therapeutic Services program and is the daughter of Kevin and Hayley Thompson. She will attend Arkansas Tech University to major in Nursing.